Talk about stick-to-your-ribs fare: The 10th annual Windy City Ribfest in Uptown brings together vendors from Chicago (Robinson’s Ribs, Rancho Mateo) and the suburbs (BBQ King Smokehouse, Chicago BBQ Company), plus out-of-state entries from Arkansas (Porky Chicks) and Texas (Austin’s Texas Lightening BBQ), among others. 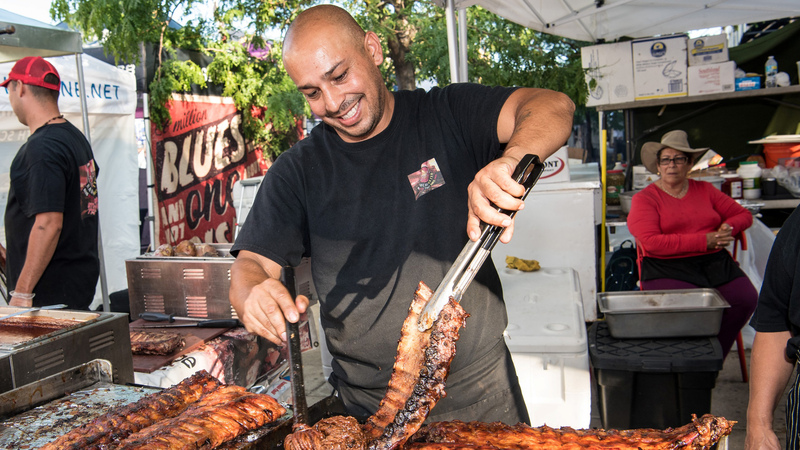 Vote for your favorite ribs, browse arts and crafts and dance to live music from 16 Candles (Friday), Electric Lotus (Saturday) and Rod Tuffcurls & the Bench Press (Sunday) among others. Outdoor living is in full swing – literally. The city’s annual alfresco dance party Chicago SummerDance kicks off this week on a giant open-air dance floor downtown. Learn new moves during an hourlong dance lesson at the top of the session, followed by two hours of music and dancing to Brazilian samba (Thursday), swing (Friday), salsa (Saturday) and Argentine tango (Sunday). Nearly 50 bands and DJs participate in this year’s lineup, which continues through Aug. 25 in Grant Park and a handful of satellite locations. Thanks to new developments in veggie fare (here’s looking at you, Impossible Burger), more people than ever are going meatless. See what all the fuss is about when the the four-city Vegandale Food and Drink Festival stops again in Chicago to celebrate all things plant-based. Named for a one-block stretch of Queen Street in Toronto, the tour features dozens of vendors serving up vegan comfort food and craft beer, wine and spirits. The event is dog friendly; rain or shine. A new entry to Chicago’s market scene pairs skyline views with vintage finds. Hosted by open-air shopping plaza Roosevelt Collection and Twisted Vintage, the Rooftop Vintage Market offers vintage and handmade goods from local vendors, live jazz from Riley and the Red Hots and food vendors. Browse handbags, personal care products, home décor, furniture and more while soaking up city views (and sun, we hope). Flights of fancy await in the suburbs, where more than 20 colorful hot-air balloons highlight the annual Eyes to the Skies Festival. Watch daily balloon launches in the morning (5:30 a.m.) and evening (6:30 p.m.) – weather permitting – or opt for a birds-eye view of the grounds on a tethered balloon ride ($20). The festival also includes nightly “balloon glow” shows (8 p.m. Friday through Sunday), two stages of live music, a carnival, children’s entertainment and activities, more than 50 food vendors, a craft fair and a nightly fireworks display (9:45 p.m. Friday through Sunday). Adult Swim is bringing its zany brand of grown-up entertainment to Chicago, and you’re invited to the party. See unaired Adult Swim episodes, pilots, specials and more at Adult Swim on the Green, hosted by comedian Zach Fox. The evening also includes games and activities, a beer and wine garden, food and drink vendors and exclusive Adult Swim merch. Note: outside food is allowed (though you can’t grill or cook), but you cannot bring your own alcohol. Make use of your free time this weekend to stop and smell the roses – and browse some art along the way. The annual Chicago Botanic Garden Art Festival features 100 juried artists along the garden’s esplanade. Browse botanic-themed and botanic-made jewelry, photography, ceramics, paintings and other works. The landmark Ebony/Jet building on Michigan Avenue may have changed ownership, but you can experience the design sensibilities of the former Johnson Publishing Company headquarters as part of the new exhibition “A Johnson Publishing Story.” Opening Thursday at Theaster Gates’ South Side arts building, the show, part of the yearlong Art Design Chicago initiative, examines the role of the publishing company in “defining and disseminating a black aesthetic and culture” across the U.S., and features original furnishings and interior design elements from the offices, along with books, periodicals, ephemera, paintings, and sculpture that comprise the Johnson Publishing archive. Celebrate the city’s sudsy side during Friday Night Flights. The roving summer series returns for a second year to toast Chicago’s more than 65 neighborhood breweries. Tasting passes ($15-$20) include 10 3-ounce beer samples from various breweries. This week, head to Logan Square to salute Milwaukee Avenue entries, including Aleman, Lake Effect, Pipeworks, Revolution, Hopewell, Piece and others. Food vendors and music round it out. Millennium Park’s summer lineup of free concerts is underway. This week includes four consecutive nights of music under the stars when the Grant Park Music Festival highlights the work of Schubert (Wednesday) and Dvorak (Friday and Saturday). On Thursday, the Summer Music Series presents British jazz group Sons of Kemet and Haitian-Canadian singer and guitarist Melissa Laveaux. BYOB. Rules for what else you can (and can’t) bring to the park are listed here.